THE TAKE HOME: WHAT IS THE BAZAN EFFECT AND WHY IS IT IMPORTANT TO A QUANTUM CLINICIAN? Dr. Bazan is a neuroscientist who’s work influenced me while I was a resident at LSU and long before I had a quantum perspective. He was the first person I can recall in my training that was able to link clinical diseases to the RPE in the retina by discovering something called the Bazan effect today. He was initially studying what effect seizures and lack of blood flow had on the CNS. He found when the brain is stressed for any reason neurons release two types of essential fatty acids, namely omega 6 and omega 3. There names are arachidonic acid (AA) and docosahexonic acid (DHA). These are essential FFA’s because the body has a poor capacity to make them endogenously. Arachidonic acid is found ubquitously all over the body in all cell lines but DHA goes mainly to the retina and brain. Both become critical parts of the cell membrane EMF antenna in cells that work in wireless fashion using various non linear apsects of the electromagnetic spectrum. The release of both of these fats created major questions for science 30 years ago. Bazan found that the release of AA and DHA occured very rapidly. This speed was initially felt to be a post-mortem or a pathologic side effect of a stimulus. His lab also raised the question whether the event was related to normal physiologic function. He used electroshock experiments to figure out the truth. He found once the EMF was used to create the electroshock that once the fatty acids were relased they RETURNED to the cell membranes by two pathways. He found the release was a REVERSIBLE event anf this told him that the release of AA and DHA to EMF’s was tied to physiologic function. This set the stage for his lab finding the key links between seizures and neurodegenerative diseases. AA is a precursor molecule for all the prostaglandins and many other important mediators that were eventually discovered by Bengt Samuelson at the Karolinska Institute. Because these mediators all have 20 carbons they are called eicosanoids. In 2003 and 2004 he linked these mediators to diseases of the eye and brain via the discovery of neuroprotectin D1 (NPD1) which is the FIRST MESSENGER or mediator of DHA metabolism. He found that neuroprotectin D1 is intimately involved in electroshocks, in siezures and in ischemia of the retina and brain disorders. NPD1 functions to protect neurons from metabolic, photolytic, and EMF damage. NPD1 comes from DHA which has 22 carbons so it comes from a family of chemicals called docosanoids. HOW DID BAZAN GET HOOKED ON THE EYE FOR HIS RESEARCH? He began his work in the 1970’s in argentina when he had no money or deep resources. So he sent his scientists to the slaughter houses to fetch cow eye’s to study the retina as a proxy for the brain. The eye were considered a waste product to the meat industry so they were a convenient and cheap way to begin this research. One of the things he stumbled upon in the 1970’s was how unique the retinal pigmentum epithelium was in the photoreceptors of the cow eyes. He had no idea what John Ott discovered about the RPE and the retinohypothalamic tracts in the 1960’s and 1970’s. Ott discussed these in his own book called Health and Light. Dr. Bazan was the first person in science to show that the RPE chief goal was to “eat” or phagocytocize the tips of the photoreceptors in the eye everyday to help recycle them. The RPE then processes the broken down parts of the photoreceptors and retrieves certain molecules and recycles the photoreceptors in the retina daily. He found this renewal of the photoreceptors did something rather unique with DHA. DHA retrieval occured by two loops in this process. Bazan named the processes of DHA recycling in the retina. The long loop brings DHA from the diet when it is needed but for it to work the DHA has to be processed in the liver first to enter the brain and retina. This implies that liver dysfunction like leptin resistance and many gut diseases can hinder this cycle. This is why gut dysbiosis and gut function cause brain and eye related diseases in some people. Bazan has never figured out why the long loop has to have passage through the liver to operate. For ten years I have believed the reason was tied to making sure most dietary DHA had to be placed into the SN-2 postion to gain access to the retina or brain. The short loop does not need SN-2 processing because the photoreceptors recycled DHA is already in the SN-2 position and just needs to be recycled by the RPE’s phogocytic ability provided leptin resistance is not present in the gut or eye. The interesting thing is that adiponectin controls both the short and long loops of recycling. Early on in my leptin re-education I found this illuminating to my new perspective on what builds wellness. Recall that DHA in the SN-2 position makes it paramagnetic and this makes it drawn to magnetic fields of mitochondria. Where do the magnetic fields of mitochondrial come from? They come the spinning ATPase head of mitochondria as current flows from cytochrome one to the ATPase. In retina and brain diseases there is a loss of magnetic field generation because mtochondrial function is poor due to high % heteroplasmy and because uncontrolled apoptosis removes neurons from the retina and brain. 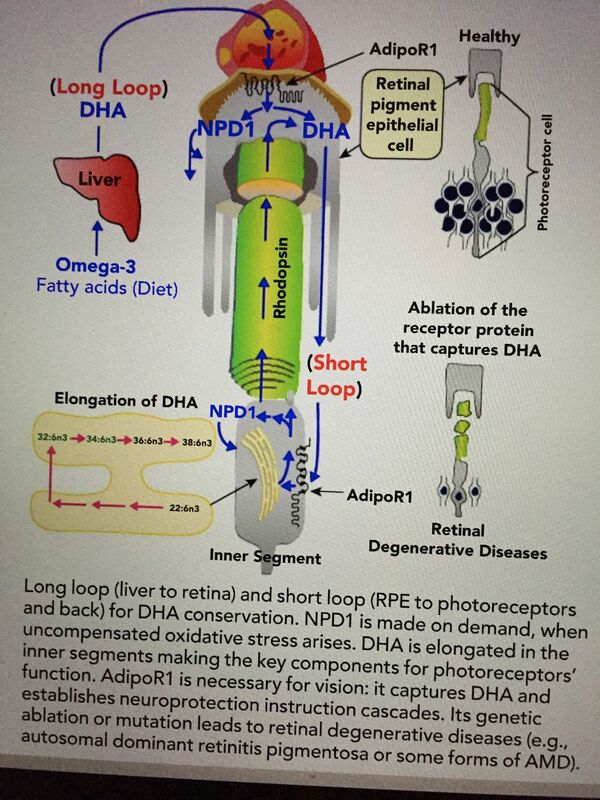 The short loop occurs in the RPE to outer segment of the photoreceptors to any stimulus and the DHA released goes directly to the inner segment of the photoreceptor with the help of adiponectin receptor 1 (AdipoR1). AdipoR1 is a regulator of these cells’ functions and I have a sense that AdipoR1 responds differently to different light frequencies to alter physiologic functioning of the RPE and the retinohypothalmic tract that controls all growth and metabolism pathways in humans. You might recall that adiponectin has the direct opposite effects of leptin physiologically. You might also recall that the retinohypothalamic tract connects the retina to the SCN and the leptin receptor in the hyopthalamus. This entanglement is critical to understand. Growth is necessary in the eye for wellness (dopamine and melatonin), but it is always stimulated by damage (ROS) intiated by certain light frequencies (blue) that create specific free radicals in the mitochondria. The damage is designed to be limited by regeneration programs/frequencies (red) powered by the free radicals. The light stimulus frequency is what releases AA and DHA from the photoreceptors in the eyes. These two lipids give their directions to the biogenic amines made with in the eye by a molecular resonance phenomena. The principle of molecular resonance is easy to understand. Light is an oscilatory wave from the outside and the chemicals in the photoreceptors are the inner oscillators. Mitochondria in the RPE can also be thought as inner oscillators in this wireless system. 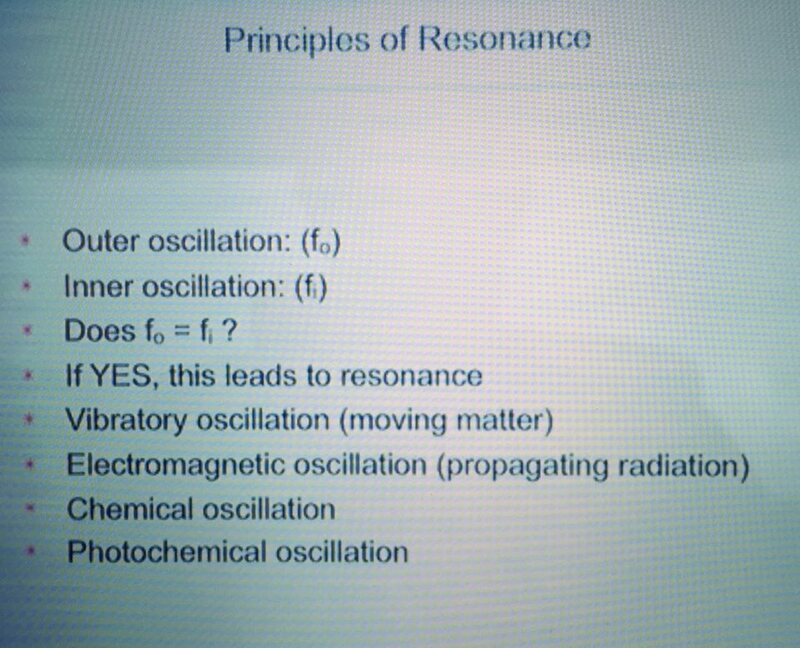 To get a wireless resonance to operate we need the light oscillation to equal the inner oscillator’s absorbance spectrum. When this occurs this leads to wireless resonance between sunlight frequencies and the hydrated photoreceptors. The resonance is capable of vibratory oscillations that move the molecular parts in the photoreceptors. 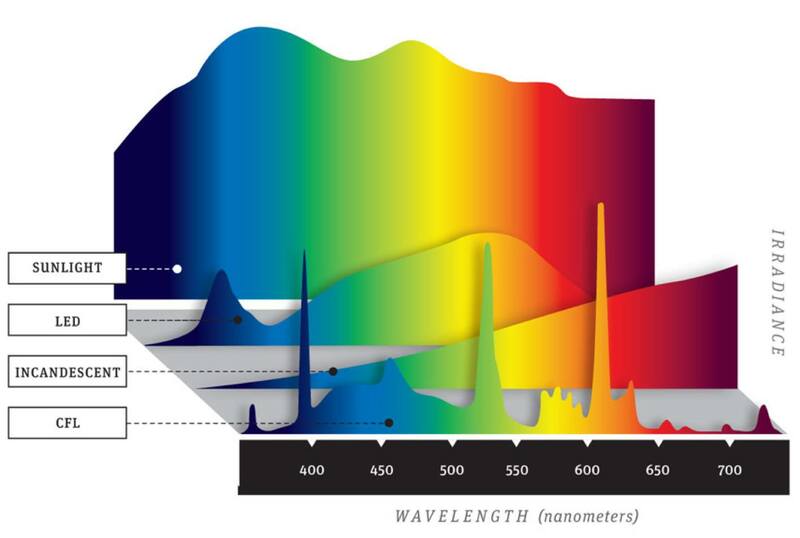 Since light is an electromagnetic waves it is propagating radiation that can cause both chemical oscillation and a photochemical oscillation in the retina. Codons which make proteins have a degnerate code, and this code allows for proteins that appear the same to have different oscillatory resonance and this is how variable solar frequency can control the day night changes in proteins of the eye and skin. Those photochemical oscillation appear to interact by resonance communication with the mitochondria in the RPE to control the short loop of AA and DHA (Sn-2) recycling that occurs in the photoreceptors. This resonance is specific to the RPE absorbance spectra. It turns out aromatic amino acids also have a specific absorbance spectra in the UV range and purple light oscillation can control those amino acids to make the bio-genic amines in the eye. Those two bio-genic amines are dopamine and melatonin. They both contain aromatic amino acids that absorb UV light 260-289nm that leaks into the eye in small quantities. These are specific light frequencies with specific kinetic energies that affect the long and short loops present within the RPE of the eye via a molecular resonance mechanism. When the sun rises it always has a specific chronic spectrum containing equal parts blue green and red in its spectrum. Initially, UV light is not present at sunrise. Natural blue frequencies in AM sunlight makes specific ROS that stimulates the pituitary gland in the AM by a molecular resonance to release the hormones from 6-10AM as the AM spectrum begins to vary. Red light is always present in sunlight from sunrise to sunset. 42% of sunlight is IR-A light. IR-A is the antidote to solar blue light. Red solar light also balances the ROS stimulus of blue light’s effect in nature. This balance is lost in man’s modern world made of fake light as the picture below shows. Blue frequency spikes far exceed the red in manufactured light and this leads to more ROS and this changes the molecular resonance of things within the eye, central retinal tracts, and the hypothalamus and pituitary. Most humans no longer live in a world with this balance and this is why clinicians now see altered hormone panels in modern humans when they look. Few do. What regenerates all three photoreceptors in the eye? We have great data on this, because of Dr. Bazan’s research on the cones and rods tied to the loops for DHA regeneration mentioned above. We know the RPE provides the stage for regeneration for the photoreceptors. We have less solid data on the neuropsin and melanopsin receptors because this was not Dr. Bazan’s focus. The RPE function is tightly coupled to the production of melatonin and melatonin controls mitochondrial DNA by molecular resonance as well. I believe dopamine is controlled in the pituitary by resonance as well tied to solar spectrums in the AM. This controls the energy flux in the eye and this controls which loop is used to regenerate the photoreceptors that connect the retina directly to the leptin receptor by way of the central retinalhypothalmic tracts as the picture below shows. This oscillating resonance also can control metabolic pathways because those pathways respond to the oscillation that occur or do not occur in mitochondria. Recall that beta oxidation is known to be associated with the 100 Hz oscillation from Dr. Doug Wallace’s research. The AMPk pathway is best described as a fuel sensor for lipid and glucose metabolism in humans. It turns out leptin and adiponectin control the actions within this pathway all over the body, including the retina and brain. In humans, the control of glucose homeostasis is governed by the balance between intestinal absorption and endogenous hepatic production by the liver and the uptake done in the muscles and the retina. Here again you can see why the leptin resistance at the liver level can lead to massive circadian disruptions in the retina, muscles, and in the brain. 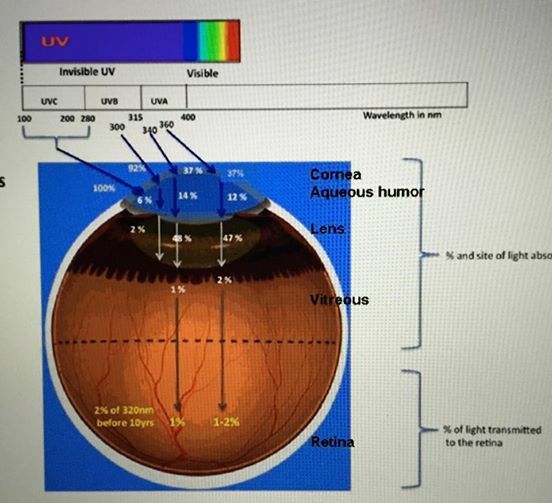 HOW DOES LIGHT FREQUENCIES LEAD TO WELLNESS AND DISEASE IN THE RETINA AND BRAIN? Different frequencies of light have different kinetic energies and those kinetic energies affect the short loop efficiency by resonance mechanisms. If the short loop is destroyed by chronic blue light exposure or by nnEMF we have to rely on the dietary long loop to replace the loss. If that person has leptin resistance at the liver level of metabolism (diabetes) the long loop does not have the ability to keep up with losses in the eye and brain. It this occurs chronically we lose the phagocytic ability in the retina and default to the apoptotic program in the photoreceptors and this links to myopia, macular degeneration, and neurodegeneration in the brain substance. The brain is not designed to undergo apoptosis in its cells. Our liver is the one tissue with a high mitochondrial capacity that does undergo apoptosis to control the flow lipids in the surfaces of things to work with sunlight. Autophagy recycles cells and this is the default program favored by the retina, brain, and heart. These three tissues have massive mitochondrial capacity and this is why the choice is clear in high demand tissues with brisk blood flow. The liver is the one outlier that favors apoptosis and autophagy likely beause it is the interface of the detoxification pathways for the blood and gut. Apoptosis = cell suicide = retina or brain atrophy. It appears we find solace in nature using autophagy because it recycles things we need to live. Our RPE and liver need these programs to operate to keep us well. 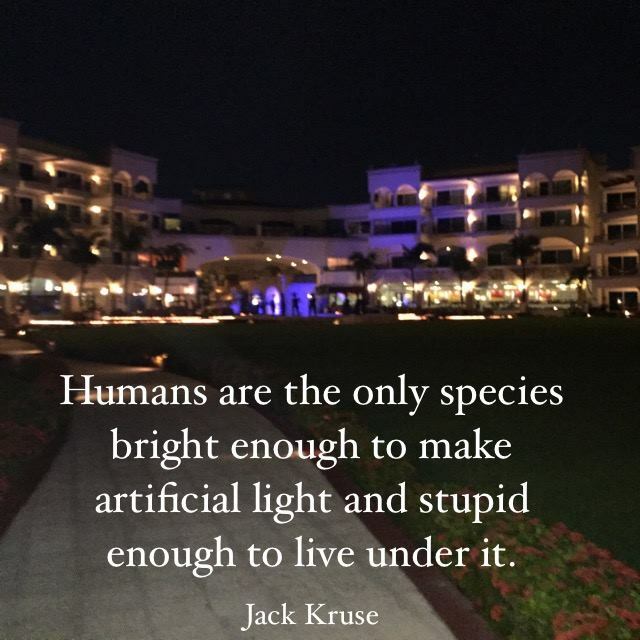 It is our cells attempt to discover who we are at this present moment by deciphering the code embedded in light we allow in our environment. Living in a microwaved blue lit world is like a perpetual state of suicide for mitochondria. The solace of nature is a detoxification of all that distorts the shape of our eyes, its lens, our personality, and misguides our path in life from wellness to illness. It even allows us to filter out the foreign opinions of food experts and hear our own voice reach our authentic character and practice fidelity to self. Once you fix the eye and liver of leptin resistance you can achieve massive reversals of disease previously thought impossible. They key is to begin as soon as you get the wisdom built into the physics of cells and tissues. Autophagy is evolutionarily conserved stress response that is present in all living cells. Like apoptosis, autophagy is a programmed response and has several sub-pathways. Unlike apoptosis, autophagy promotes life rather than death. Apoptosis is a suicide program for cells. Autophagy is the best way to get rid of bad mitochondria without harming or killing the cell. Dr. Bazan work unfortunately focused in the cone and rod photoreceptors because he is interested in camera vision. Melanopsin is the more important opsin because it is the gate keeper of the central retinal pathway that links the retina and leptin receptor. 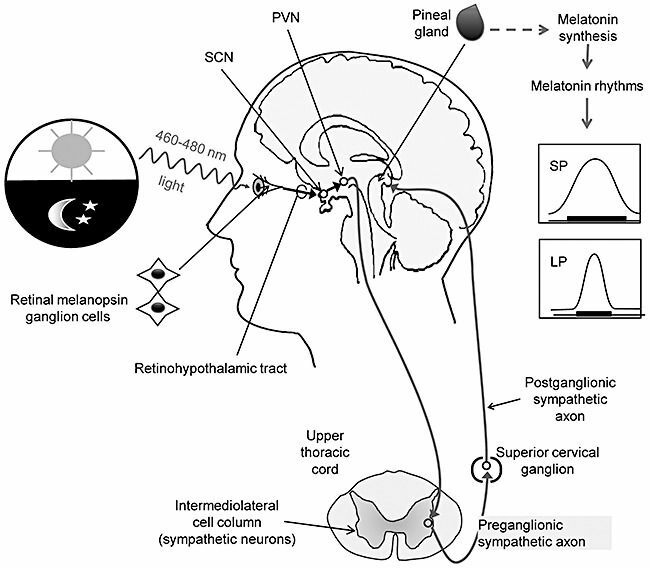 Melanopsin works with light 430-465nm at dusk when we move from bright daylight to sunset. Since melanopsin is found in the more superficial layers of the retina, distant from the RPE, it would seem poorly placed to obtain DHA and Vitamin A (cis-retinaldehyde) from the RPE cells. This raises the question of how melanopsin recovers from photonic bleach of blue light? An attractive hypothesis is that it uses an independent, more local, source of DHA and Vitamin A rather than relying on the RPE-based visual cycle. We’ve also found out that melanopsin is resistant to photobleaching of daytime sunlight. This last effect makes sense when you understand how melanopsin is regenerated in daytime. Two articles in this issue of PNAS cited below (4,5) test these hypothesis and provide the most compelling evidence to date that melanopsin does indeed use its own separate regeneration mechanism and retinol cycle (Vitamin A cycle) in vivo. It appears we regenerate eye camera vision at night and melanopsin during the day during bright sunlight. The results of both papers suggest that ipRGC photoreception can function independently of outer retinal pigment recycling machinery, and suggest that chromophore depletion of the outer retina indirectly inhibits inner retinal function. I’ve seen this in many cases of blue light toxicity in neurosurgery cases. This makes sense for a diurnal animal with a retina that works differently in day or night. Humans are such an animal. Our human photopic retina means that our biology is not optimized or designed around scotopic eating of food or exposure to light at night. This appears to be a simple quantum rule built by how Mother Nature built photoreceptor regeneration and links to our mitochondrial design. The higher the kinetic energy of light stimulus, when it strikes something, the bigger the waveform it makes in its target. This implies a flickering high kinetic energy light could act like a machine gun trying to activate a dead dying target to move to action. This is why flickering light seems to help in retinal and brain diseases like Alzheimer’s disease. So when light makes contact with water in blood or in cells, like the RPE, what kind of waves can it make? It can make solitons and phonons. What are they? They are quasi particles like excitons. Read my recent Reality 2 blog again to understand why this is important Excitons form the basis of the entire food web on Earth. This means solitons and phonons might be important. What controls phonons? Magnetic fields control them. What is missing in Alzheimer’s patients? Magnetic fields. Why? The ATPase in mitochondria spins slower in AD and overall there is less mitochondria because of how apoptosis has gone unregulated in the brain by what wave forms? Blue light and nnEMF, like RF/microwaves from technology gadgets. Today, magnetic therapy is well established worldwide but no so much in the USA because of Big Pharma’s influence. Japan has given official approval for the use of pulsed and permanent magnetic devices for healing. In Germany, the medical results of pulsars convinced the government health care system to officially recognize and reimburse the cost of electromagnetic treatments. Of course we can use light to make phonons to generate specific kinetic energies and this is why some crafty quantum folks have created devices to take advantage of these aspects of light using water within the body. HOW DO MITOCHONDRIA AND THE NUCLEUS LINK TO BACTERIAL VIRAL ORIGINS OF LIFE ON EARTH? I want you to realize the nuclear genome is 98.9% made up of HERV viruses. And then I want you to realize your mitochondria is a stolen bacteria that was forced to change by deleting most of its genes. It now has 37 genes and only 13 that contol the building of the respiratory proteins. Now how do these facts relate? Alzheimer’s Disease (AD) and AMD are both mitochondrial diseases and the focus of Dr. Bazan. Bacteria have been collaborating and competing among themselves for nearly four billion years by lateral gene transfer. Moreover, Nature only came up with the eukaryotic cell once in plants and animals. It is ironic that viruses have been here longer than both bacteria and Archea and HAVE THE ABILITY to force bacteria to do things “the virus” wants and needs it to do based upon the light environment it senses. Viruses change bacterial cells and eukaryotic cells rapidly and massively, and we ignore this evolutionary trick at our peril especially in diseases like AD and AMD. What has viral science taught me? Dead hosts (high heteroplasmy mito) can still make virus react (nuclear DNA) and a dead virus (bad nuclear DNA) can also make more virus (other nucleus in cells = cancer) to change more hosts (more cells or metastasis). This makes virus’s unique in biology and it also points out why the enemy of an enemy is often our FRIEND in biology. This is counterintuitive to modern beliefs. I have a deep sense this was part of the equation that formed the mitochondrial nuclear partnership 650 million years ago in plant chloroplasts and 600 million years ago in our oceans in animal mitochondria under a special part of the electromagnetic spectrum which likely drove the change by pushing the viral agenda. Two systems co-exist in our body, mitochondria and nuclear genomes. One bacterial and one virally based. Sitting in your body are 100 TRILLION cells. Each cell is an independent living entity. You’re ability to think of yourself as a single individual is really an illusion of reality. You’re really a colony, and the colony uses this artifice of “I”-ness as way for all the cells to act coordinately to get more resources, to breathe, to get more energy and so on. Then inside each of 100 TRILLION organisms is a whole colony of bacteria we call mitochondria. And that colony of bacteria has a totally independent life and independent evolutionary history and has its OWN objectives. The nuclear genome (viral based) has an ability to modify its energy flux to a changing environment. This is why astronauts cells leak viral particles when they are in space and not on Earth. NASA is perplexed by this but a mitochondria expects it. And that bacterial colony of mitochondria which is a “they” which is inside the “we” and the “we” generally thinks of itself as an “I” or a “you”. But really in fact it’s all a big ILLUSION of life. 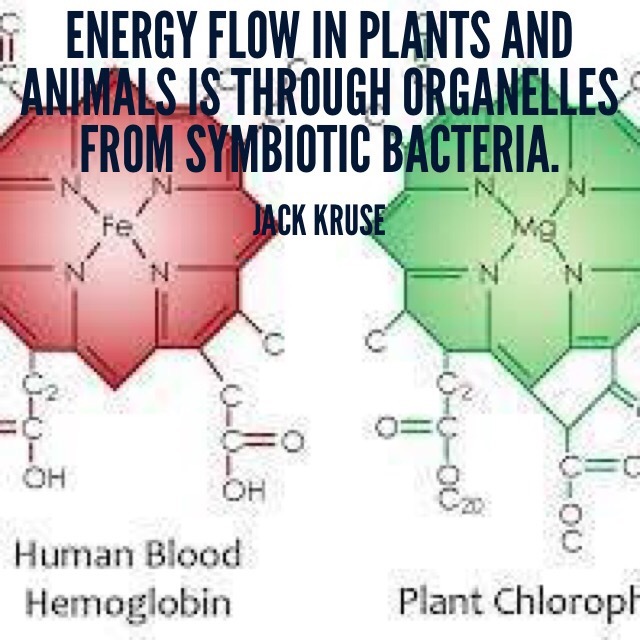 All this results in how the cell generates energy and how we use energy to get the life we live. Life is dynamic because of this energy colony of bacteria. Bazan’s entire career at LSU is based upon finding the links between eye diseases and brain disease. I spent ten years around this environment at LSU reading all his work never fully understanding what I was learning until 2006. It was then that my new quantum perspectives about cells, it all began to make sense. In AD and retinal diseases, there is a complete breakdown of energy flux from a mitochondria due to altered light frequencies and this changes how viral nucleic acids are expressed in cells. This change alters the kinetic energy in the system and leads to wide spread tissue changes that alter how DHA is used in the eyes and lipid membranes in all tissues by many mechanisms including light resonance from the sun. The lack of DHA in tissues causes an increase in apoptosis due to the lack of resonant control of proteins and this is why neurons are lost in the retina and frontal and temporal lobes in these diseases. And all the energy we use in these systems originally came from SUNLIGHT. In fact, all of your energy flow comes from sunlight. 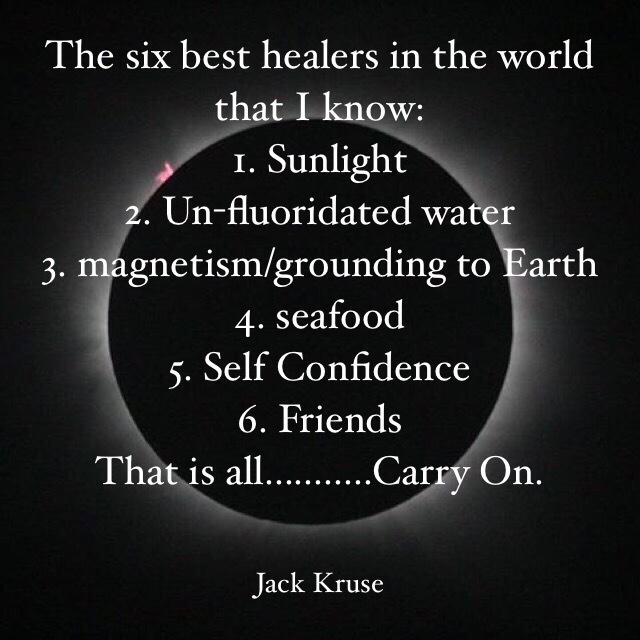 And everything about your energetics is based on your connection or disconnection to sunlight. Normal mitochondrial physiology is responsible, in part, for the aging process itself, as free radical production within the mitochondria results in a lifetime burden of oxidative damage to DNA, especially the mitochondrial DNA that, in turn, replicate the mutational burden in future copies of itself, and lipid membranes. Those lipid membranes need to have DHA in them to operate well just as the situation presents itself in the RPE and the photoreceptors. This quick take explains how where I have taken you in those blog 6 years ago to where we are now in this new understanding of life. Cooling has massive effect on liver metabolism and fat metabolism. This means that cooling has a massive effect on RPE long and short loop DHA recycling. Cooling lowers leptin levels and raises adiponectin levels. This implies cooling alone has massive effects on the long and short loops of DHA recycling in the retina and brain to reverse circadian mismatches. 90% of life on the Earth is cold-adapted and lives in cold regions. Most life is not equatorial. DHA is rather rare in equatorial fish where the water is warmer. Polar water has fish high in DHA content. This makes quantum sense when you realize that the solar power at the poles is a lot less than it is at the equator. It also implies that life at the poles likely uses an uncoupled mitochondrial haplotype and the long loop of DHA more frequently than equatorial life forms. They always have the sun available and can rely on the short loop in the RPE. This should also point out why sunglasses, spectacles, and contacts might be real problems in how the system is organized. Low temperatures slow down and inhibit chemical reaction rates of enzymes, the “work horses” of cell metabolism. This means cold temperatures slow growth and optimize metabolic efficiency by stimulating autophagy and not apoptosis. As before, cold makes proteins and enzymes and receptors of hormones bend their proteins in different ways than warm temperatures do. How do omega-6 and omega-3s fit into the picture? As it gets colder, molecules get more rigid and become less flexible. It turns out DHA content is linked to the shape and size of things in cells. Anything that changes size or shape alter thermodynamic relationships to incident light or incident magnetic flux. That’s why as it gets cold, cell membrane signaling becomes so important as the coordination of cellular activities becomes critical. The warmer it is, the less omega-3’s are needed for cellular signaling and this is recapitulated in the oceans of Earth. The colder it is, the more omega-3’s are needed for cellular signaling and this is recapitualted in the oceans of Earth. What’s the best diet for a cold-adapted animal with a uncoupled haplotype? A seasonal ketogenic diet high in omega-3 content. Summer time carbohydrates maintain mitochondrial biogenesis. How much does season matter to omega-6 and omega-3 content? We’re meant to load up more on carbohydrates and omega-6 PUFA’s in the summer and fall in preparation for hibernation in the winter. The hibernation and cold then liberate that higher omega-6 content from our cell membranes. But that proper winter and hibernation period never comes because of modern conveniences (artificial light, heat, etc.). This results in highly-concentrated levels of omega-6’s over time and increase our hs-CRP, as well as wrecking our hormone levels because it changes what happens in our liver and what loops we can or cannot use in our retina’s. Hypothyroidism is a proxy for a human living in a blue light toxic environment. This is why Hashimoto’s is now explosive in its incidence and prevalence on Earth. Anything that changes the function of the retina effects the retinaohypothalmic tract that links directly to the leptin receptor. Doyle S. E., Castrucci A. M., McCall M., Provencio I., Menaker M. Proc. Natl. Acad. Sci. USA. 2006;103:10432–10437. Tu D. C., Owens L. A., Anderson L., Golczak M., Doyle S. E., McCall M., Menaker M., Palczewski K., Van Gelder R. N. Proc. Natl. Acad. Sci. USA. 2006;103:10426–10431.